The RUSH MH 8 Mini Profile is Martin Professional’s smallest moving head to date with super sharp optics and an impressive output that punches above its class. High speed pan and tilt with separate color and gobo wheels allow designers maximum flexibility from the lounge bar to the high-energy dance floor, and all within an affordable price bracket. The MH 8 Mini Profile uses the latest 18 W white LED technology that delivers super sharp optics with over 800 lumens via a 14° beam angle. Eight varied gobos and eight vibrant colors are available, with electronic strobe/dimming, manual focus and high-speed pan and tilt. 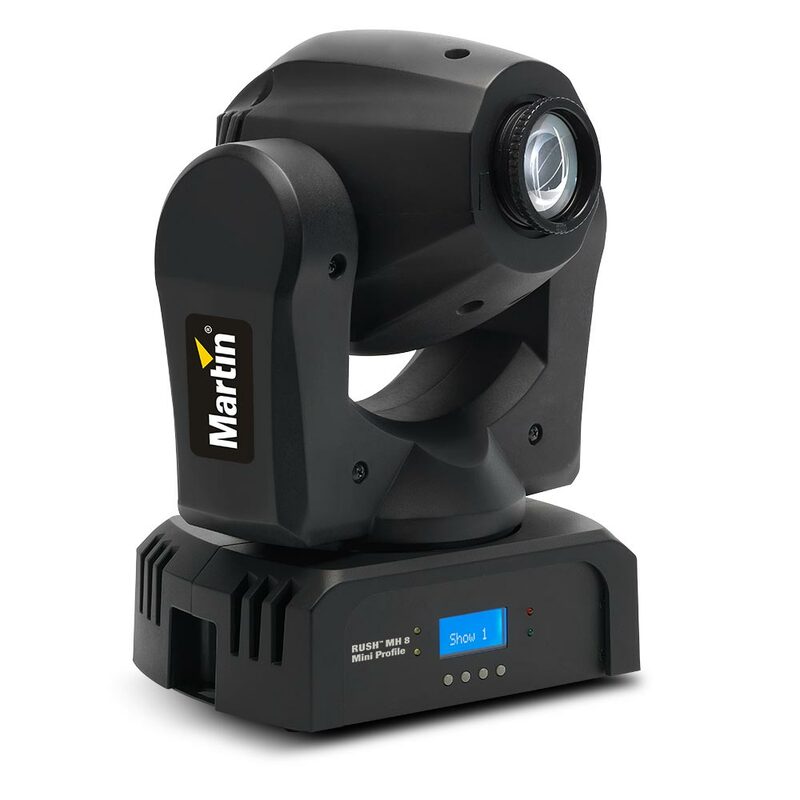 The eye-catching effects can be controlled via DMX or synchronized to a music beat via audio trig. The compact fixture weighs only 4.5 kg. Typical Power and Current120 V, 60 Hz: 52 W, 0.8 A230 V, 50 Hz: 50 W, 0.5 ATypical half-cycle RMS inrush current: 6.4 AMeasurements made at nominal voltage with all LEDs at full intensity. Allow for a deviation of +/- 10%. ThermalCooling: Forced air (temperature-regulated, low noise)Maximum ambient temperature (Ta max. ): 40° C (104° F)Minimum ambient temperature (Ta min. ): 0° C (32° F)Total heat dissipation (calculated, +/- 10%, at full intensity, full white): 180 BTU/hr.